The O’Reilly public relations people asked me to answer some questions about the new Intermediate Perl so they can prepare materials for reviewers and the press. As a reader of this website, however, you get the answers before they do, and you get my full answers, which might show up as edited excerpts in O’Reilly’s materials. 1. What has changed with this new edition? In the previous editions of Intermediate Perl, we covered packages, references, objects, modules, testing, and finally distributions. We built up from the small things to finally create a distribution. That’s not how people work, though, so we changed things around. We covered references, which are much more useful than just objects. That’s the first third of the book. Then we cover packages as a prelude to the big change for this edition. We then move immediately into creating a distribution. We show readers where they’ll end up before we show them how they’ll get there. This is how developers actually work—they create the distribution then modify it. This provides us a framework for introducing each new concept. For instance, we can cover testing and quality control as we go along instead of segregating it in a chapter at the end of the book. Readers pick up these topics slowly and steadily as they move along. 2. What updates were enacted? As with all Perl book updates, we’ve fast-forwarded the content to latest version of Perl using modern style and usage for examples. That’s just the small potatoes though. We’ve also expanded coverage of subroutine and regular expression references. 3. What will excite long-term Perl fans the most? Perl has it’s own built in object system, but some developers are using a layer on top of that. Moose, a post-modern object system, deserves a book of its own. 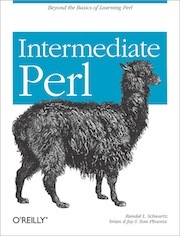 We didn’t want to write that book for Intermediate Perl, so we included a chapter to introduce Moose. We’ve created a web site devoted to this book, at http://www.intermediateperl.com. We have a downloads section that supports the exercises (and answers) as well as interact with our audience. 4. What will cause reviewers to rupture organs in their haste to review? We’ve distributed five golden tickets among the books we’re distributing to almost 1,000 reviewers. Each bearer of a golden ticket gets an all-expenses paid one-day visit to Damian Conway’s Amazing Top Ten in Alice Springs, Australia. During the day, they will interact with the ten deadliest species of snakes in world, five of which are native to Australia. At night, they’ll encounter ten of the most dangerous regular expressions, five of which are also native to Australia. Survivors can also box with kangaroos, chew eucalyptus with koalas, and pilot bottomless canoes before they leave. We’re pleased that Damian wrote the foreword to our book and has allowed us to provide this experience to our reviewers. even though the arrow rule was described earlier. There’s probably no reason. There’s not something different that happens because there is an arrow between subscripts.